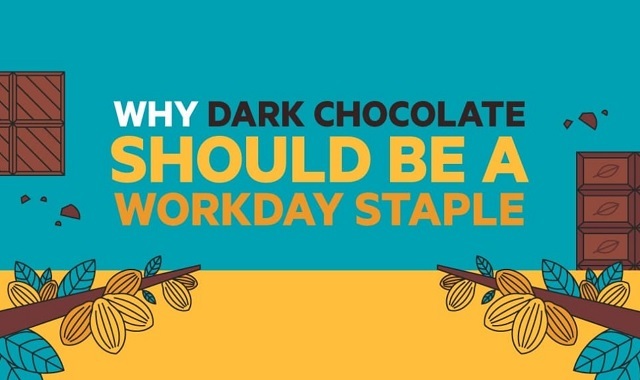 Why Dark Chocolate Should be a Workday Staple #infographic ~ Visualistan '+g+"
Believe it or not, chocolate has a well-deserved place in the office. While chocolate may feel like a treat to enjoy on occasion, dark chocolate can and should be a staple at work. No, we’re not talking about the sugary, artificially-flavored candy bars perfectly perched in the nearest vending machine. We mean simple dark chocolate that has 60 percent cacao or more—meaning there’s less space for tons of processed junk like sugar, trans fats, and artificial sweeteners, flavors, and colors. With this more pure variety, a little goes a long way. Research shows dark chocolate has some impressive benefits. For instance, regularly snacking on it can improve blood flow to the brain and significantly improve cognitive function. Interested in learning other ways chocolate can help you power through your work day? Read on for more benefits plus tips to choose the healthiest chocolate for your workplace.